I love handmade gifts. I love giving them and I love receiving them. There are few things more special than giving your time and creative energy to another in this way. Every time I give someone something I’ve made there’s always a mixture of emotions. Of course there’s a bit of pride. Its that, “Look what I made! Do you love it! ?”…sort of feeling. But there’s something else too. I don’t know how to describe it other than apprehension. Every artist knows this feeling. It’s the nervousness you get on the eve of your gallery opening. It’s not that I am worried they won’t like it. Everyone loves it when you make something special for them, even if it’s not perfect. In fact its probably because of it’s imperfections that it is so special and cherished. No, this feeling is entirely different. It is distinct and the best word I have for it is exposed. It is quite the paradox that the creative impulse to make and share your work with others is almost always coupled with a undeniable feeling vulnerability. Any time I make something from the ground up I feel it but with this project the feeling was more pronounced that usual, acute even. 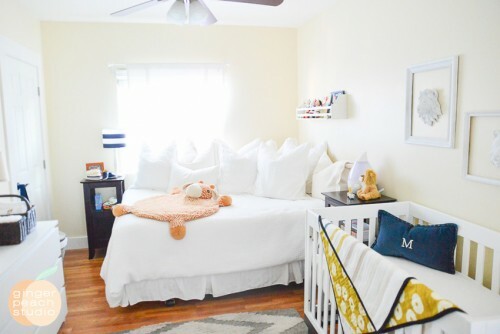 When I was pregnant with my daughter Evelyn last year I became (mildly) obsessed with finding the perfect baby quilt “recipe”. I’ve made quite a few baby quilts in the past and I had never completely satisfied with the results. I always liked the way they looked when they were finished but I never liked the way they functioned. Babies are tiny after all, and I once I had finished a quilt it just never had the right feel to it. They were always too stiff even after being washed. I just felt traditional batting had too much body for something as small and delicate as a baby. I could never imagine the child choosing it as their favorite. After all, a baby doesn’t know how much time you spent on it. They’re not concerned with the patchwork design. A baby interprets the world by how it feels to them. Is it comfortable? Is it soft? Is it soothing? I have an adult friend that still sleeps with the baby blanket she received as an infant. Only it doesn’t look like a blanket anymore. It’s a wadded tangled ball of pale yellow string. A stark difference from the crocheted form it took the day it was given to her. I wanted that level of comfort. 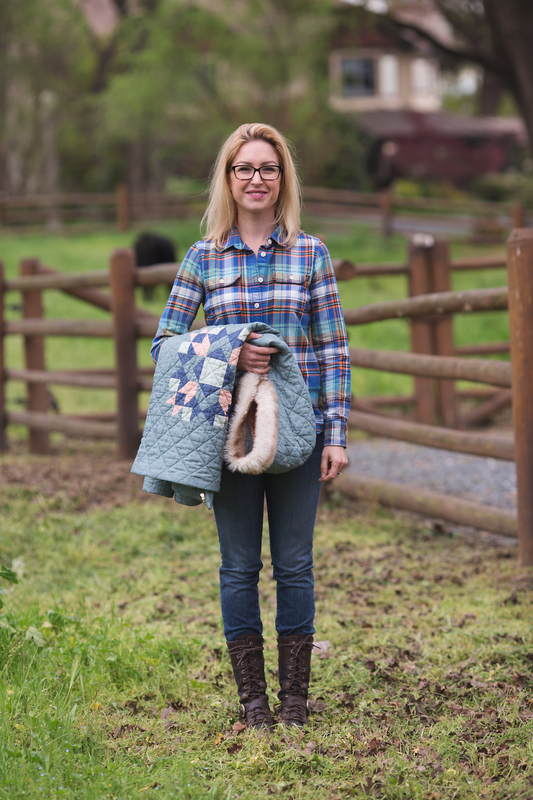 I wanted to make a quilt that looked beautiful and felt like a hug when Mommy wasn’t around. I wanted a quilt that was light as a feather but draped every curve of the body. Something soft and luxurious that kept you warm but felt like fresh, cool bedsheets. We had a quilt like that in my house when I was growing up and we all fought over it. It was an ugly quilt too. It didn’t matter. None of the others felt the way that one did. The sad part of this story is that I did not perfect the recipe in time for my daughter’s quilt to be finished. Her quilt, while a lovely and adorable addition to the nursery decor, lies draped over the edge of her crib where I presume it will stay unless I spread it out on the floor as a play mat. The happy ending to of this story however, is the quilt featured here. 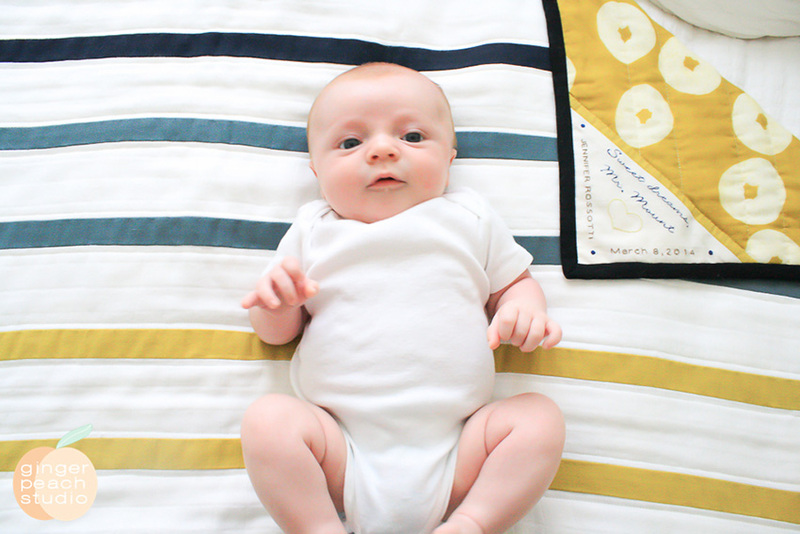 This baby quilt is 40″X40″ and made completely out of imported double and triple gauze fabric from Japan. It is a simple design of smaller, colored strips alternating with larger, white strips. The colors are arranged in a way that has a graduated color effect that I find both modern, and soothing. It is every bit of the baby quilt I had been dreaming of and so it is named. This is the quilt I wanted to wrap my baby in. It has amazing drape yet the loose weave of the fabric makes it possible for your infant to move in an unencumbered way. The nature of the weave also makes it light and breathable so as to prevent overheating. It is truly the baby quilt that dreams are made of and I could not be more pleased with the way it turned out. I made this quilt for a very dear friend who after trying to conceive for quite some time, finally became pregnant with their first child. What a blessed event. I wanted to commemorate it the best way I knew how. I’m sure the fact that this quilt was for someone so close is another reason for the heightened feelings of vulnerability. It was incredibly personal and I know the second she opened it that the “emotional work” I had put into it translated through the work of my hands. That is what handmade gifts are all about for me. That moment. That moment where someone feels so special because you created something just for them. 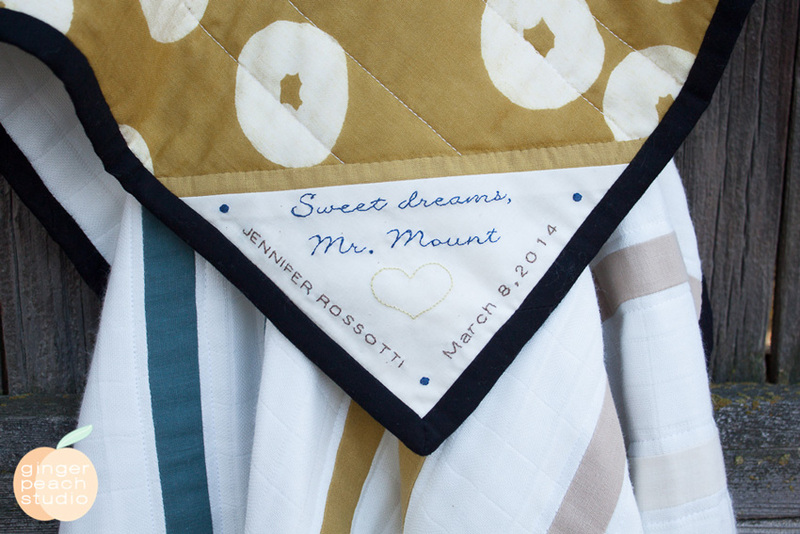 I finished the quilt with a hand-embriodered label so Mr. Mount will always know how much his Auntie Jen loves him even though we are far apart and I don’t get to see him as often as I’d like. I purchased all of the solid colored double gauze from my friend Rachel’s at Imagine Gnats. She has a lovely curated collection of fabrics available in her shop. All her double gauze options can be found here. The triple gauze bamboo/cotton blend that I used for the white background AND batting was purchased on Etsy but is no longer available. A very close match can be found here. The lovely doughnut print by Muddy Works used for the backing was found at Jones & Vandermeer. Good morning Jennifer!! LOVE THIS!! Keep up the great blogging!! Jen, This quilt means so much to me and I know it will to Henry one day soon. I love you and appreciate your talents and more importantly your friendship more than you know. I can’t WAIT for you to meet this little man. Soon. Very soon. 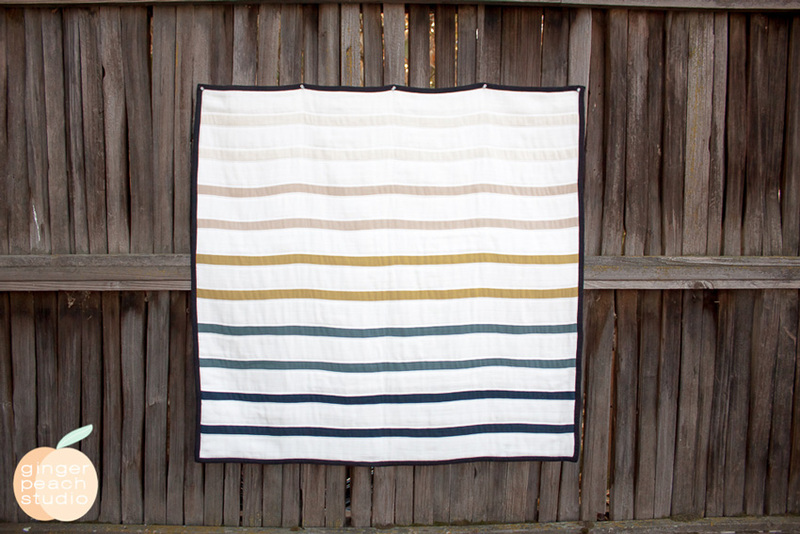 I love this blog, and your quilt! Beautiful. I love your fabric choices…. I just checked out this listing and it went to a laminated double gauze fabric. Is that what you used for your batting? Ps. Teascha I updated the link in the post. Thank you for letting me know it was bad. Hi! I’m in love with this article. I share your feelings entirely! I just purchased some double gauze from Japan and planning to use it to make my sweet little man a quilt for his 1st birthday! I had a couple questions for you though since you’ve worked with this material before and I haven’t. Did you pre-wash the material? Did you actually quilt on it? Did you use the gauze for your binding as well? Hoping to hear back from you! Thanks! Hi Teascha. No I did not pre-wash the fabric, and yes I quilt on it. Although the quilting isn’t very dense. I like the looseness of a lightly quilted baby quilt. I think it adds more softness, and drape. 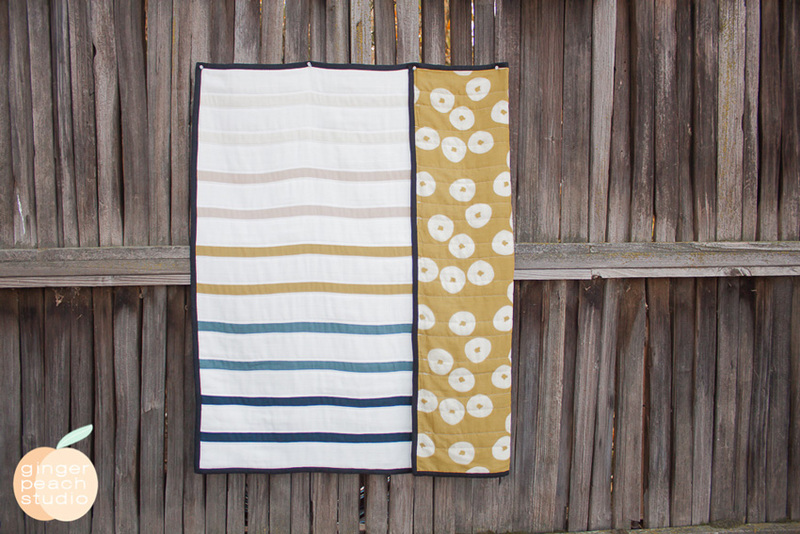 There is a few more tips on this post about working with double gauze http://gingerpeachstudio.com/mod-square-baby-quilt/. I hope you will find them helpful. You will love double gauze quilting. I have made many baby quilts using it and some full sized ones too. They are always my favorites. Thank you for answering my questions! I really appreciate your help and guidance!